Chrys Akem reiterates the importance of promoting soybean at the workshop. The IITA/SARD-SC maize system soybean production enhancement planning workshop was held 1-4 February in Abuja to promote soybean cultivation and utilization in Nigeria. The workshop became imperative because of the huge deficit in the annual demand for the crop. Demand is currently estimated at 2.2 million tons; the annual production of 600,000 tons is grossly inadequate to meet this demand hence the need for a concerted effort to bridge the gap. The project is expected to mobilize the strength and expertise of stakeholders in the maize–soybean value chain to support production of soybean, a complementary crop to the maize commodity value chain in the SARD-SC project. In his opening remarks, Chrys Akem, SARD-SC Project Coordinator, reiterated the importance of soybean and bemoaned the current low cultivation of the legume in the country. “This workshop is an opportunity for us to walk our way back to the days when we had a surplus and strengthen soybean cultivation as a companion crop to maize.” Akem enumerated the many advantages of soybean as a food and nutritional security crop in Africa and the many existing high yielding varieties with good resistance to rust. He mentioned the opportunity for market linkages through the innovation platforms while challenging the soybean growers and poultry feed millers to maintain the sustainability of the soybean industry. 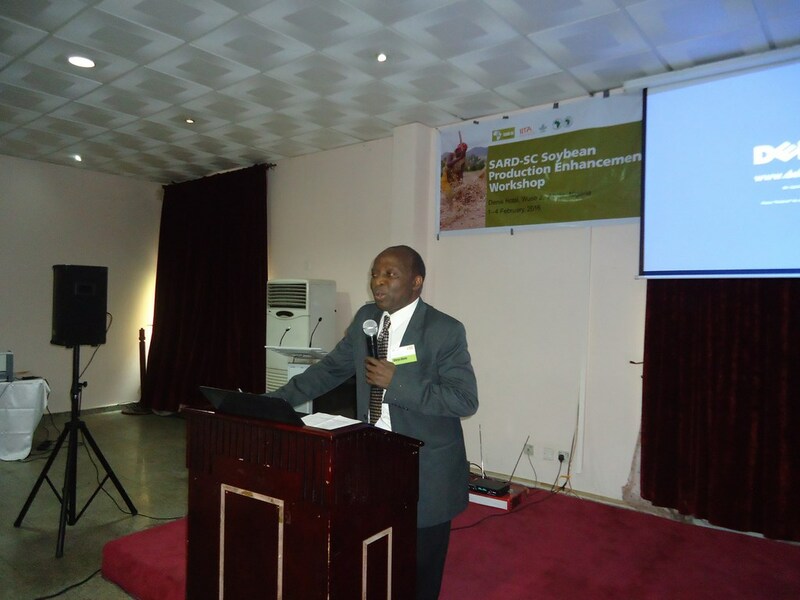 Sam Ajala, Maize Commodity Specialist, emphasized how the workshop participants could help map out a focused and clear goal for the crop in the next five years, and introduce business-led models to market soybean. In his paper, titled Enhancing Soybean Production within the SARD-SC Maize Project in Nigeria, Kolawole Ojo, SARD-SC Soybean Scientist, stated the economic importance of the crop and the complementarity of maize-soybean production. “Soybean improves soil fertility through atmospheric nitrogen fixation. Processed soybeans are the world’s largest source of animal feed and the second largest source of vegetable oil,” he said. Ojo said that the SARD-SC project will help generate improved maize and soybean production/utilization technologies; ensure dissemination/promotion of improved technologies; enhance food and nutrition security; and contribute to poverty reduction in Africa. Ojo emphasized the importance of partnership with national and international scientists, seed companies, processors, farmers, NGOs, and extension workers as part of the operational strategy to achieve these projections. Some of the steps to enhance soybean production include capacity building of the value chain actors, and generation and promotion of preferred maize/soybean varieties that could be adapted to various agroecologies and that are tolerant to major biotic and abiotic stresses. Soybean scientists from research institutes, soybean farmers, poultry farmers, representatives of seed companies, and other interested stakeholders attended the workshop and brainstormed on the strategies to enhance soybean cultivation. They also deliberated on the way forward for soybean production enhancement. yusuf abdulazeez on Yam vine cuttings from aeroponics develop shoots in 2 weeks!